Samir Kuntar, A Free Man Again, But for How Long? This weblog follows the career of the worst terrorist ever freed by the Israeli authorities, and builds on my article "Samir Kuntar and the Last Laugh." Shlomo Avineri and I don't usually agree, but he has an article in Ha'aretz today, "The state, not the families," that builds nicely on my characterization of Israel as "a once-formidably strategic country has degenerated into a supremely sentimental country, a rudderless polity where self-absorbed egoism trumps raison d'être." Anyone looking in from the outside at the emotional turmoil and media circus surrounding the return of the bodies of Eldad Regev and Ehud Goldwasser would likely have concluded that Israel is run not by the government but by families worried about the fate of their loved ones. Since the matter of [Hamas hostage] Gilad Shalit has still not been solved, it is worth returning some sanity to the public debate, and not to repeat our mistakes. Shalit's return is not a primary strategic challenge for Israel. Israel has a clear responsibility to bring him home, but it also has a more important commitment to protect its citizens from rocket and mortar fire, because an entire region and tens of thousands of people are suffering from these attacks and the terror they bring. And the state is responsible for defending them. Hamas' control of Gaza, and not Shalit's abduction, which is one of its consequences, is the strategic challenge facing Israel. There is no easy answer to this challenge, which is characterized by an extremist group committed to Israel's destruction only a stone's throw from Israeli population centers. It also includes the never-ending attacks on Israeli towns, and the links between Hamas and Iran - and its threats. The way Israel deals with the strategic challenge of Hamas has effects far beyond Gilad Shalit's personal fate. The cabinet must have the courage to tell the public this, and the family, too, despite all the pain. After all, the state sends its soldiers off to battle knowing the risks to their lives. It is critical to understand that policy is set by the state, not the families. July 23, 2008 update: Kuntar (who is Druze) has vowed to fight for Hezbullah and kill more Israelis, MEMRI documents today. July 28, 2008 update: My article on the Israeli decision to release Kuntar inspired a retort by Yoram Schweitzer that the Jerusalem Post published on July 24. I reply to Schweitzer today, again in the Jerusalem Post, in "May an American Comment on Israel?" Aug. 3, 2008 update: Schweitzer has again critiqued me, to which I have commented at "A Final Reply to Yoram Schweitzer." Sep. 2, 2008 update: "Samir Kuntar: I met with Abbas in Beirut at his request" reads the Associated Press headline. One may not need more evidence of the character and politics of Mahmoud Abbas, but this supplies it anyway. For this, Israel's Prime Minister Ehud Olmert pathetically rebuked Abbas, telling Abbas: "You are not a man of terror, and I didn't expect you to meet with such a despicable killer as him." To which, Abbas replied that the meeting was unplanned. Olmert retorted that Abbas still need not have met Kuntar. Oct. 23, 2008 update: More news from this delightful individual who says he is more committed than ever to eliminating the Jewish state. "As long as there is something called Israel in this region, the resistance must continue ... and I am totally committed to the resistance. I am ready to take part in any resistance mission." In Hizbullah-speak, of course, resistance means terrorism. "The resistance will end only when the Zionist entity disappears." Jan. 30, 2009 update: Mahmoud Ahmadinejad, Iran's president, has awarded a medal to Samir Al-Kuntar at a Tehran ceremony, along with Mustafa Dirani and Sheikh Abd Al-Karim Obeid (who helped abduct Ron Arad). Ahmedinejad honored the three for their imprisonment in Israel and for their "supporting the Palestinian and Lebanese resistance." Kuntar praised the Islamic Republic of Iran. Dec. 1, 2009 update: Kuntar went on hajj to Mecca where he met with the Palestinian religious affairs honcho and was called (by the Islamic Jihad website) the "star" of the Palestinian pilgrims. He gave an interview deriding Israeli will, in part based on his own release: "The enemy's government will consent to the names demanded by the resistance organizations and to the number of prisoners. But the organizations need to stand their ground, be insistent, and not agree to any concession because concessions will draw additional concessions." Addressing prisoners currently jailed, he said. "I spent 30 years in jail, and I ultimately got to see freedom." And he called on Hamas and Fatah to unify. Dec. 27, 2010 update: Yedi'ot Aharonot reports that Syria's President Bashar el-Assad has just met Kuntar, and this for the second time. The first time was not along after Kuntar's release. 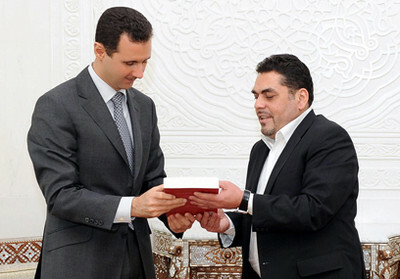 Samir Kuntar gives Bashar el-Assad a copy of his book, "My Story," about his 30 years in Israeli prisons. July 31, 2011 update: It appears that Kuntar was injured in an explosion in a Hezbollah stronghold in south Beirut on July 29, perhaps an Israeli attempt to knock of Hizbullah's leader Hasan Nasrullah, but details are sketchy. Aug. 20, 2012 update: The town authorities in Bizerte, Tunisia have honored Kuntar. The silver lining to this moral horror is described by Benjamin Weinthal of the Jerusalem Post: "a Salafi mob stormed last week's ceremony, accusing Kuntar of a pro-Shi'ite position favoring the Assad regime and its slaughter of more than 20,000 Syrians. Kuntar, 50, escaped the meeting hall through a back exit and several people were hospitalized." June 23, 2015 update: The double Israeli error of releasing Kuntar and then not executing him is becoming more and more obvious in the aftermath of an attack by Druze on the Golan Heights on an IDF ambulance carrying a wounded Syrian across the frontier on June 22. The incident, called "a lynching" by the Israeli authorities, "shocked Israel's defense and political establishments" according to the Jerusalem Post. "The man who is behind the incident that is fueling the violent events here is Samir Kuntar," said Jabber Hamud, the head of the Sagur regional council who also serves as the chairman of the Druse and Circassian local councils. "We've known this for some time, and I call on the heads of the defense establishment to do all that is necessary." After his release from an Israeli prison Kuntar became a senior official in Hezbollah, the Lebanese Shi'ite movement. He was put in charge of the Syrian part of the Golan Heights, with a special emphasis on the Druse community there in particular. According to Israeli military sources Kuntar commanded in the past months a few terrorist attacks against Israeli soldiers in the area. July 29, 2015 update: According to initial reports, Israeli forces today targeted Kuntar, now the leader of a pro-Assad militia, and killed him along with four others in a car in Lebanon. Sep. 8, 2015 update: It appears that Kuntar remains alive; the U.S. government today made him a "Specially Designated Global Terrorist." Arab media reported Sunday morning that Israel assassinated Lebanese terrorist Samir Kuntar. Several Israeli Air Force missiles struck the Damascus suburb of Jaramana, killing Kuntar and eight other operatives, in the early hours of Sunday, the reports said. According to Reuters, the "National Defense Forces" in Jaramana, a militia loyal to the Assad regime, mourned his death. "His body has been sent to a Damascus hospital moments ago," Reuters quoted the group as saying. Kuntar's brother Bassam took to Twitter to mourn his death. At least eight others were said killed in the alleged targeted assassination, including a senior National Defense Forces commander who Israeli media said was himself involved in attacks against Israel. The building in which Kuntar was believed to be residing was "completely destroyed" in the attack, according to initial reports. Comment: (1) As I suggested in 2008, no longer responsible for this monster, the Israelis would feel free to go after him, and they did precisely this; the "surprise happy ending" I mentioned then has taken place. (2) It took seven and a half years, but the Jewish state finally got the last laugh. Asked Saturday about Hezbollah leader Hassan Nasrallah's recent public appearances and the issue of deterrence on Israel's northern border, Bar-Lev, a member of the Knesset Foreign Affairs and Defense Committee, said: "I would not advise Nasrallah to leave his bunker. Why? Because he is the enemy, a target. He should be a target, and so on a personal level I would advise him to keep looking after himself." Pushed on whether Nasrallah should be targeted "at the first opportunity, just like Samir Kuntar," Bar-Lev was initially evasive. "I will obviously not comment on one [military] operation or another," he said, but seconds later, when it was put to him that the killing of Kuntar was a great "achievement" by Israel, he said: "Yes, absolutely." Bar-Lev, a former commander in the IDF's elite of Sayeret Matkal unit, then said: "Israel definitely has a long memory. I was still a young officer when I was catapulted into the terrorist attack in Nahariya, when Kuntar and others killed the Haran family, so I too have a long memory, and I will leave it at that." He concluded by saying that Kuntar's killing "was certainly a message to Nasrallah." Mar. 24, 2017 update: It appears that the Israelis have had the same "last laugh" with Mazen Faqha. He organized a suicide bombing in 2002 that killed 9 Israelis, then was released in the 2011 deal that won Gilad Shalit's freedom. Deported to Gaza, he resumed his Hamas career of planning attacks, now from the West Bank. Yesterday he was assassinated by unknown gunmen, presumably working on behalf of the Israeli government.